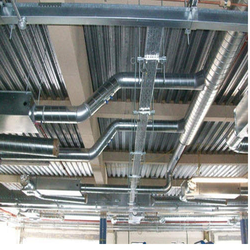 Our range of products include ducting systems, exhaust ducting system, spiral ducts, aluminum ducting, frp ducting systems and pp-frp ducting systems. We are offering Wide range of Ducting Systems are used in heating, ventilation, and air conditioning (HVAC) to deliver and remove air. 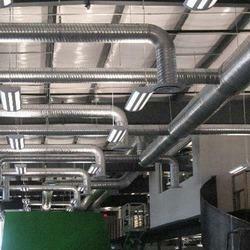 We specialize in the erection of domestic and Industrial Air Duct Work that gives consistency. High grade material is used to fabricate attachments, fittings, components, and accessories etc that are used in duct work. We are backed by an efficient team of professional’s machinery that enables us in fulfilling diverse requirements of our clients within the committed time frame. We are fabricating wide range of Exhaust Ducting System to our valuable customers. Made using optimum quality materials and metals, these products are assured for their seamless design and optimum quality. Owing to their durability and robust design, these exhaust ducts are highly demanded in the market. These ducts are usually light weighed and are immaculately finished, giving them an advantage. These are crush resistant and can overcome problems like bad odour and moisture. They possess a long functional life and are durable. They are made available to the clients at a very reasonable price. They are built in accordance with the set industry standards and safety norms. We fabricate wide range of Spiral ducts are made out of Quality GI sheets manufactured by metal industry’s leading steel manufacturers and use of quality GI sheets ensures rigidity. Spiral duct is attractive and is frequently specified by architects because of its superior aesthetic appeal, it can be finished to blend in with or stand out in an indoor ambiance. We supply high quality of Aluminum Ducting for your Clients .This lightweight malleable and corrosion resistant metal is used as cladding on exposed Rectangular or Spiral duct. Apart from this, Plain type (Reflector / Matt finish) is also widely used as air ducts in areas such as swimming pool, clean rooms of sensitive/industrial films etc. We offer heavy duty and high strength PP-FRP Ducting Systems used in thermal plants, and chemical & petrochemical industry. 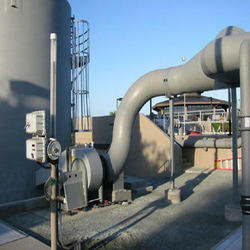 Our chimneys help in controlling pollution in these industries. The length and width of the chimneys depends on the amount of smoke and the chemical components of the smoke. We also customize these as per specifications provided by our clients. Industrial Ducting offered to come in quality construction finish and can be made available in standard and OEM specifications. 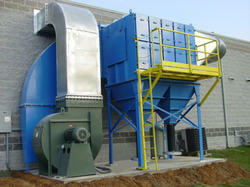 We offer high performing Dust Collection System that entails dry collection with wet venting by Dust Collector. The Dust Collection System ensures neat and clean dust free environment. The Dust Collection System controls and eliminates the dust particles. The Dust Collection System also arrests to a great extent, the dust that forms a very fine layer around the Work Place in an Industries. 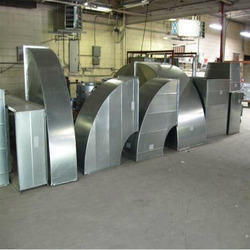 We Fabricate Stainless Steel (SS) Ducts. 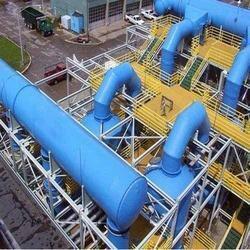 Which are used In chemical industries and in Automobile industries. The Use of stainless steel duct-work for any specialist application is recommended for its strength and rigidity which is similar to a galvanized iron duct. Its appearance though is much sleeker than the one in an aluminum duct it stands way out for its corrosion resistant characteristic. For SS Ducts stainless steel sheets are available in two qualities i.e. Grade 316 & Grade 304. We manufacture and supply high quality of MS Ducting System that is used in Automobile Industries, Manufacturing Industries, etc. MS ducting is made from the high quality mild steel which contains 0.16–0.29% carbon being neither brittle nor ductile. In kitchen exhaust MS ducts are largely used owing to its inherently fire resistant characteristic which can be further enhanced by Fire Rated Spray Coat or painted with multiple coats of Red Oxide. This offered system is designed using premium class base component that are sourced from the authentic vendor of the market and is fabricated at our well established manufacturing unit using highly sophisticated tools and technology. The offered system is available in various technical specifications and can be customized as per information laid down by our renowned clients'. With the excellent support of our brilliant professionals, we are engaged in presenting Industrial Ducting Systems. 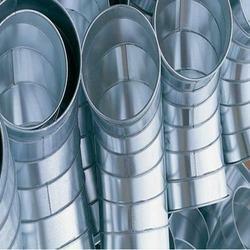 The offered ducting is developed in accordance to industry norms and quality parameters. In the offered ducting, our professionals use the approved material during the manufacturing process. 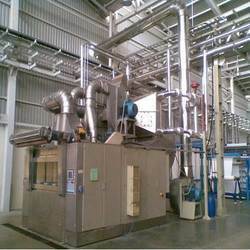 In addition, this ducting can be built and developed according to the specification provided by the clients. Furthermore, our professionals opt for strict quality inspection made on the ducting to ensure high performance. 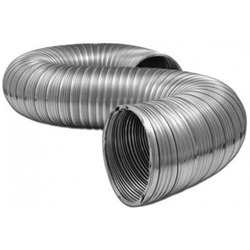 We are offering of G.I Ducting Systems. 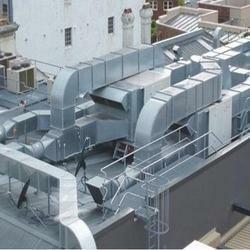 We manufactured to meet the most stringent HVAC/Industrial specifications and quality standards. Rectangular GI Ducts are fabricated out of hot dipped galvanized steel sheet of lock forming quality as standard duct material. With the help of our experienced team of professionals, We have been able to manufacture and supply our clients a wide collection of GI Dusting System. It is designed and manufactured by our skilled professionals in compliance with international standards using high grade mild steel, aluminum or special alloy and latest technology. Our offered ducting is available in both belt drive and direct drive arrangement. 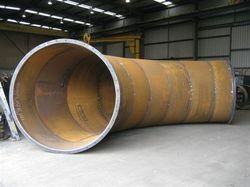 Looking for Industrial Ducting ?